It is a real pleasure for me to be with you again at this 'Chinese Bridge' competition. As a way of introduction, let me share the thoughts I had as I travelled here. I was wondering how British young people might surprise me again! I have been really impressed in the past two years by contestants in this competition, with their mastery of the Chinese language. · Stewart was studying at the School of Oriental and African Studies of the University of London. · He was the champion in the UK round of the Ninth Chinese Bridge competition. · Then Stewart survived numerous rounds in China. · I was so delighted when he won top prize in the final, beating contestants from all around the world. That was the best record of any British contestant. Last year, Peter Dolby from the University of Edinburgh at this stage of the contest impressed me. He stood out along with three other students in this UK round of the competition. They later collected one first prize, two second prizes and one third prize. Together, that was a truly golden team from the UK. So, I look forward to your outstanding performance in this year's competition! The 'bar' has been set high in the past two years! So, your challenge will be to create a "bumper harvest"! That means bringing home prizes for the UK for three years in a row. I have also wondered about why British contestants have done so well in this international competition. I am afraid that is not a matter of pure talent! I have found three reasons why UK students do well in this competition. These are taken from my experience in Britain since I came more than two years ago. · Chinese language course is available in nearly 600 primary and middle schools in the UK. Some schools even included Mandarin in their curriculum. · Children from over 60 schools entered the recent Panda Pals Speaking Contest hosted by the Chinese Embassy. Their Chinese proficiency was both impressive and encouraging. · Fifty-four British universities offer Chinese language courses. · Chinese studies is chosen as a field of study by 85 universities. · From 2009 to 2010, nine prestigious British universities alone registered 556 undergraduates majoring in Chinese. · These universities included Oxford, Cambridge and the University of Edinburgh. · Also in these universities, 537 double degree students took Chinese as one of their majors. · 214 candidates studied Chinese teaching for their graduate degree. · A total of 19 Confucius Institutes and 60 Confucius Classrooms were opened in England, Scotland, Wales and Northern Ireland. They are indeed around the UK. · No other European country can compete in this regard. · Last year, His Royal Highness the Prince of Wales unveiled the Confucius Classroom in Llandovery College. I had the honour of accompanying him there. · The First Minister of Scotland the Right Honorable Alex Salmond attended the launching ceremony of the Confucius Institute of Glasgow University. · The All Party Parliamentary China Group and the Confucius Institute for Traditional Chinese Medicine of the London South Bank University jointly hosted the UK Confucius Institutes National Conference. 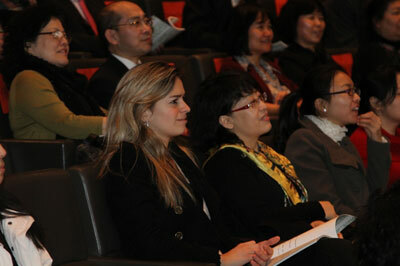 · The Schools Network is also committed to promoting Chinese learning in British primary and middle schools. · Our two countries have worked closely to improve Chinese teaching in the UK. 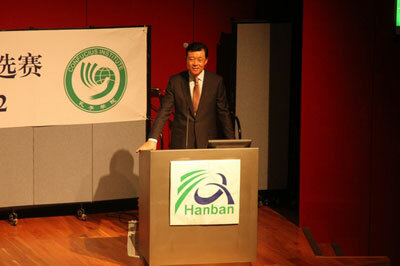 · The result is in all Confucius Institutes and Classrooms, the number of students is growing. · We made huge efforts in training teachers and selecting teaching materials. · We encourage sharing digital and distance teaching resources. · We increased scholarships for studying in China. I have wondered also about why British young people are so interested in learning Chinese. I believe it can be explained in two ways. First, they are fascinated by the Chinese culture. Literally, Chinese Bridge means Chinese language is a bridge. Its abutment is the rich traditional Chinese culture. Its floor is a dynamic modern China. This bridge will lead you to a colourful China. Second, they see great opportunities in learning Chinese. As China grows, the UK and other countries will need to engage more with China. Naturally, the demand for Chinese speakers will grow. For example, HSBC plans to set up 800 branches in China. A Chinese company Huawei wants to employ 1,000 people here in the UK. You can imagine that companies like these would want people speaking both English and Chinese. They need talented people who understand both Chinese and British culture. That is the key to being able to add value to business and increase prosperity. I am delighted that so many British young people are learning Chinese. The reason is simple. You young people are the future. You are the future of China-UK relations. 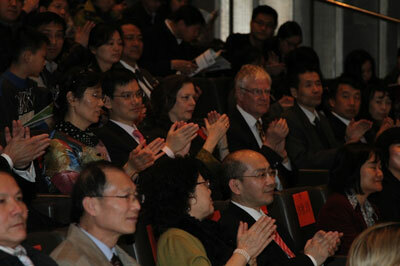 Recently on 13th March, we celebrated the 40th anniversary of China-UK full diplomatic relations. We share pride in what we achieved in the past 40 years. We have every reason to be confident about the future of our relations. The responsibility of continuing the success of our relations for the next 40 years will rest with future generations. In other words, the young people of today. The future of our relations needs more Chinese young people to understand Britain. It also needs more British young people to understand China. The future of China-UK relations need all our young people to work together in building a bridge of China-UK friendship. In conclusion, I want to thank all Chinese teachers, volunteers and teaching assistants in the UK. I wish all contestants great success in today's competition and the coming finals in China. I assure you that I will be your cheerleader! 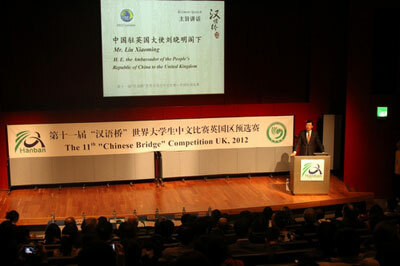 Now, I declare open the UK Regional Final of the 11th Chinese Bridge Competition.